Somerset may have avoided relegation, but they have been unable to retain the services of their outstanding young England wicketkeeper batsman Jos Buttler. Buttler, a 23-year-old who has developed through the club's youth system, confirmed hours after the season finished the news that many Somerset supporters had long feared: he is to leave the club to pursue opportunities elsewhere. It is highly likely to be confirmed within days that he will join Lancashire, with an announcement expected on Wednesday. Buttler had little realistic choice. With his opportunities of keeping wicket at Somerset blocked by Craig Kieswetter, himself a young man with genuine international aspirations, he had to decide whether to concentrate on a future as a specialist batsman or leave the club. "Both Jos and the club have worked extremely hard over the last few months to find a solution, which satisfies Jos's understandable desire to have more time behind the stumps in order to advance his international career," Somerset's chief executive, Guy Lavender, said. "I would like to make it clear that he has behaved impeccably during this difficult process. "However the Club, on a matter of principle and pragmatism, feels unable to offer a guarantee to Jos - or any other player - of selection in their preferred role. Such a situation would be unfair on team-mates as well as those selecting the side. We thank Jos for all he has done for the club and wish him well in the future." Buttler said he was "very sad to be leaving Somerset" but needed to pursue opportunities that would help his development as a wicketkeeper. Buttler is currently the man in possession of the gloves for England in both limited-overs formats. "I am immensely grateful for all the help and support that everyone at Somerset has given me which has shaped the player and person I am today," he said. "I would like to wish the club the best of luck for the future." In a perfect world, Buttler's last game for Somerset might have ended in a more exciting fashion. The sun had helped bring a decent crowd to Trent Bridge and there might, with some imagination, have been a target set of around 300 in 60 overs. But both sides were wearied by recent struggles and no such conversation took place. Instead the season ebbed, in Marcus Trescothick's words to "a quiet draw". It says much for the strength of promotion and relegation that it took until the last day of the season to endure a meaningless day of cricket. In the bad, old days, they were far less unusual. Trescothick scotched any suggestion that he may now retire. His second-innings dismissal - pulling a short ball to midwicket to give Brett Hutton a memorable maiden first-class victim - meant he had gone through the season without a first-class century for the first time since 1998. "I'm very glad this season is over," he said. "But nothing has changed. I still want to play until I'm 40." He wants to continue as captain, too. Talk from inside the club suggests that Kieswetter will be appointed, in at least one format, ahead of next season, but if that is the plan, nobody has told Trescothick. "I want to continue as captain," he said. "It's out of my hands what the club decide, but I want to carry on. "It's been a disappointing year. We've been very poor and very inconsistent in Championship cricket. We've let ourselves down in comparison with what we've done in previous years. We've not scored the volume of runs or bowled as well as we can. In the end, we've held on by the skin of our teeth." He compared Dave Nosworthy, the director of cricket who arrived at the start of the season, to David Moyes - Sir Alex Ferguson's successor at Manchster United FC - and admitted the club were in "a transitional period". "There's bound to be a bit of change," he said. "You've seen it with David Moyes. It's people picking up new things, running in different directions. Eventually that will gel together." Trescothick did have praise for some of the younger players, though. He agreed Jamie Overton was the most promising fast bowler Somerset had possessed since Andy Caddick - maybe even the best since Sir Ian Botham - and suggested he had the raw talent to be "as good as Allan Donald". 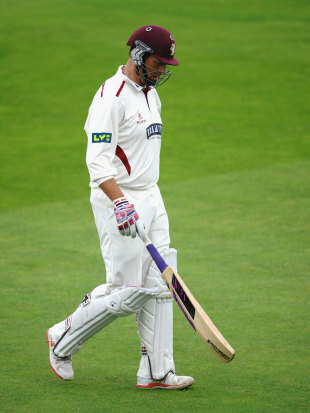 "I've seen and played against the best," Trescothick said. "And he has the calibre and quality to be that good. The world is his oyster, really. If you could mould fast bowlers, you would end up with Jamie Overton. He has all the attributes to be a great fast bowler. Yes, he has the raw potential to turn himself into someone like Allan Donald." Mick Newell, the Nottinghamshire director of cricket, also admitted his team's Championship season had been disappointing. Indeed, Newell told the BBC that it was "fairly obvious" to him after just "two or three games" that Notts weren't good enough to win the Championship. While he did not communicate those views to the side, he did decide early on to prioritise the limited-overs formats. "We have lost a lot of wicket-takers and experience in recent years," Newell said. "The likes of Mark Ealham, Greg Smith and Darren Pattinson. We may well look at bringing in a bowler as overseas player next year. Luke Fletcher and Harry Gurney have ended up carrying the bowling attack. I think if we could bring in a bit more quality and get Andre Adams fit and Ajmal Shahzad producing a little bit more of what he should be doing then we'd maybe have five or six seamers who can get us a little bit higher up the league." There was some good news for Notts, though. Chris Read, a beacon of excellence at Trent Bridge for so long, confirmed that he would remain with the club despite now being out of contract. The half-century he scored on the final day here was only the second of, by his lofty standards, a disappointing season with the bat. But he showed in the YB40 final what a fine batsman he remains and there are few keepers anywhere in the world who can better his glove work. It remains to be seen whether he retains the captaincy. Michael Lumb may well take over, in one format at least, depending on how his discussions with the club about his availability to play in the IPL progress. Newell stands by his decision to prevent his players - particular Alex Hales, who Newell said could receive a "life-changing" sum of money by appearing - participating in the IPL this year, but accepted there had been negative repercussions. He also admitted he may take a different view next year. "I don't regret that decision," he said. "But it's not set in stone. Part of Alex Hales' troubles [he was dropped from the Championship side due to poor form] may have been due to that decision and his own disappointment." Another disappointed man was Samit Patel. He went into the last session of the season requiring the wicket of one top-six batsman to finish as the FTI Most Valuable Player of the Year and win a £10,000 cheque. He was unable to do so, however, leaving Worcestershire's Moeen Ali as the victor.